To get to our place you turn off State Highway 10 (just after Oruaiti School, and before Mangonui. You drive 1.3km down Hihi Road until you see our white letter-box on the right-hand side of the road. Our place is at the end of a long gravel driveway. The caravan parking space is on the right - you will see a sign. We are situated 4kms from Hihi beach, just down the road - an easy bike ride. Hihi is a small, safe beach, excellent for swimming or fishing (to the right of the beach, along the rocks. Mangonui village is just 10min away by car. Area is surrounded by stunning beaches and harbours, too many to list. 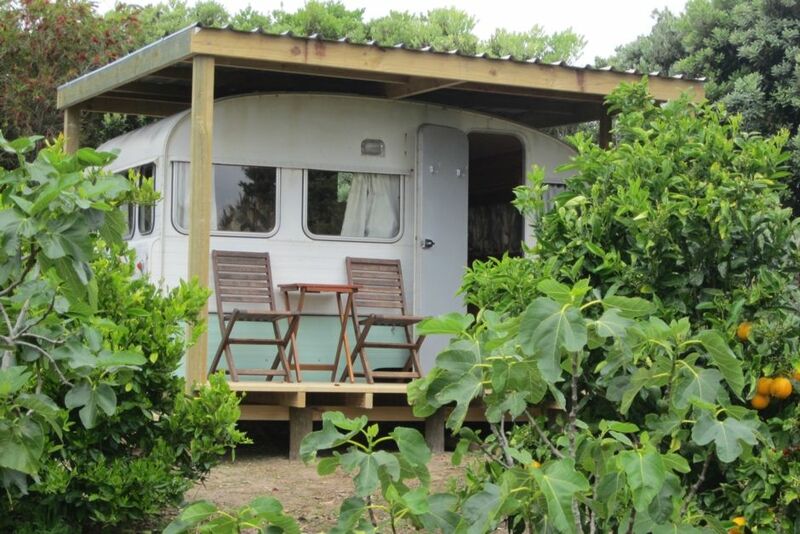 The caravan is situated a short walk away from the main house, so you have a sense of privacy, but with us on hand to socialize with if you want. Two single, narrow beds (caravan size). This is a great place for a short stay, especially if you are comfortable in a small space and appreciate vintage. Smoking OK outside, pets with prior approval (this is a farming area). Really suits nature lovers and people seeking something different. I supply a wonderful breakfast that you can prepare yourself, with the added bonus that you feel like you are camping. We are happy to interact with guests, it is up to you, a comfortable distance between our place and your bach exists. Tea and coffee provided in the caravan. Vege garden and orchard - help yourself. Very nice place to stay great view and quiet caravan had everything you need and very nice people thanks for the stay. Was a pleasure to have you and your very well behaved dog. We had a lovely time staying in the caravan. The setting was tranquil and relaxing and it was great getting away from the noises of the city. It was lovely waking up to the noises of farm animals around us. The caravan is well equipped with everything you would need and it is all clean and tidy. Mary and John are very hospitable and were more than willing to spend some time to chat and visit with us. It is situated close to Mangonui and surrounding beaches. Definitely a holiday that we would recommend. The orchard is amazingly peaceful and serene. The orchard is amazingly peaceful and serene. The caravan is clean and comfortable. We truly enjoyed our brief stay. The caravan is well equipped and in a truly idyllic spot. The caravan is well equipped and in a truly idyllic spot. It was a great place from which to explore Doubtless Bay and for rest and relaxation. Perfect for a quiet getaway, very relaxing atmosphere with great views. Gateway to a visit to Cape rianga. Gateway to a visit to Cape rianga. Perfect. ..